114. Saturday October 9th 1875. I began to work on a tidy this morning. Miss Lewis went down town. I went down in the afternoon Charlie took me down to the Harris house. In the evening Miss Lewis and I went over to Mrs Winters. Sunday October 10th 1875. It was a gloomy disagreeable day. We went to church twice and Charlie and I called at Steve Gilletts in the afternoon. I wrote to Hattie. 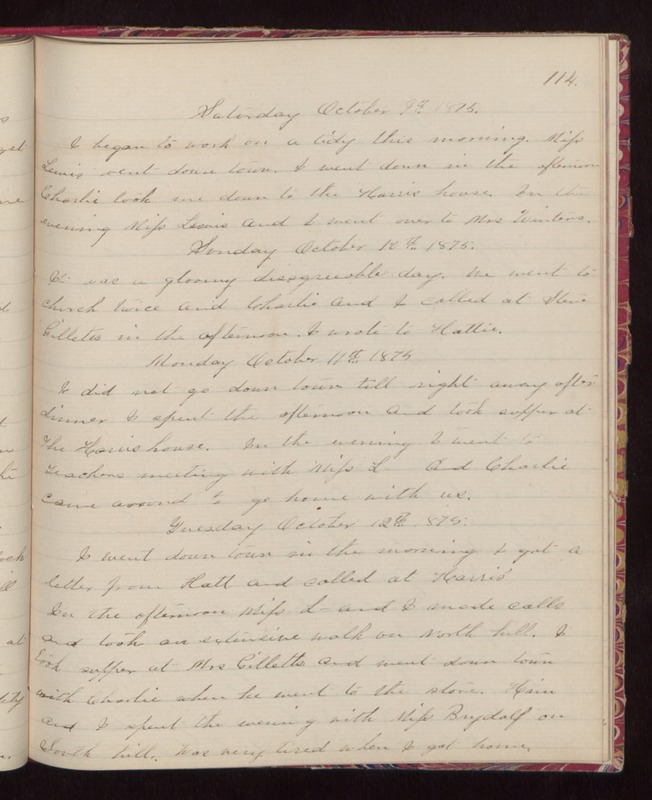 Monday October 11th 1875. I did not go down town till right away after dinner. I spent the afternoon and took supper at the Harris house. In the evening I went to Teachers meeting with Miss L_ And Charlie came around to go home with us. Tuesday October 12th 1875. I went down town in the morning I got a letter from Hatt and called at Harris' In the afternoon Miss L_ and I made calls and took an extensive walk on North hill. I took supper at Mrs Gilletts and went down town with Charlie when he went to the store. Him and I spent the evening with Miss Brydolf on South hill. Was very tired when I got home.